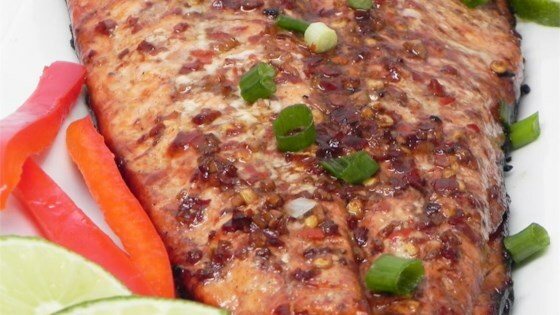 "These are salmon fillets in a tasty, tangy sauce with a little heat! Serve with rice and a simple stir-fry of baby corn, shiitake mushrooms and snow peas." Don't throw the marinade out!!! Put the marinade in a saucepan with a couple of tablespoons of dry white wine and simmer for about 5 minutes. Drizzle on the salmon - just makes it even better.